1. Introduction Use of this website and the services provided via it ("racebikemart.com") are conditional upon you accepting the following terms and conditions. Unless otherwise specified, your acceptance of this User Agreement shall be indicated by your use of and/or registration with racebikemart.com. racebikemart.com is provided by Race Bike Mart (a wholly owned subsidiary of Huddersfield Superbikes Limited t/a Earnshaws Motorcycles) whose registered office is 7 Manchester Road, Huddersfield, HD1 3LE and its suppliers ("we"/"our"/"us"). 2. Availability of racebikemart.com We will endeavour to ensure that racebikemart.com is available 24 hours per day without any interruptions. However, we reserve the right to make racebikemart.com unavailable at any time or to restrict access to parts or all of racebikemart.com without notice. racebikemart.com is a general information service. We will endeavour not to make it misleading, but we cannot represent that the information accessible on or via racebikemart.com is accurate, not-misleading, complete or up to date. 3. Use of racebikemart.com is designed for your personal, non-commercial use and you must not use it in any other way without our consent. Except as permitted under applicable law, you must not use, copy, translate, publish, licence or sell racebikemart.com or any materials or information in racebikemart.com or the structure, overall style and program code of racebikemart.com without our consent. If you wish to make a request for consent, please contact racebikemart@gmail.com. 4. Your Contributions You agree to only use racebikemart.com for lawful purposes and that any information that you provide in connection with, or which forms part of, racebikemart.com will be, as far as you are aware, true and accurate and will not infringe any copyright or trademark, or any right of privacy, publicity or personality or any other right, whether registered or unregistered, of any other nature or any person, or be obscene or libellous or blasphemous or defamatory and you agree to indemnify us against all claims, proceedings, damages, liabilities and costs, including legal costs arising out of your breach of this term. We cannot make any assurances about the information or contribution made by any other user and you should exercise caution before acting or otherwise relying upon any information you obtain via racebikemart.com. 5. Links racebikemart.com includes links to other internet sites. Without limiting what we say elsewhere, we make no representations or warranties about those sites or their content, nor that the links work. 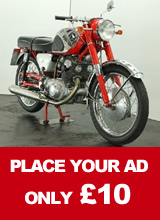 If you wish to link to racebikemart.com you may only do so at http://www.racebikemart.com. Details of our linking arrangements may be obtained from racebikemart@gmail.com. 7. Intellectual property racebikemart.com, its style and structure, and the materials and information on racebikemart.com of racebikemart.com are protected by copyright and other intellectual property rights, and may not be used by you except as expressly provided in this User Agreement. The authors of the documents in racebikemart.com assert their moral rights. 8. Our Liability Since a substantial part of racebikemart.com is both free and available to all, it is a condition that your use of racebikemart.com is at your own risk. We shall not be liable to you or in breach of this User Agreement for any delay or failure to perform any obligation if the delay or failure is due to a cause beyond our reasonable control including, without limitation, the blocking or restricting of information to and/or from our network. Except as expressly provided in this User agreement, we disclaim any further representations, warranties, conditions or other terms, express or implied, by statute, collaterally or otherwise, including but not limited to implied warranties, conditions or other terms of satisfactory quality, fitness for a particular purpose or reasonable care and skill. Save as provided below, we disclaim all and will not be liable in contract, tort (including, without limitation, negligence) or otherwise arising in connection with this User Agreement or the racebikemart.com for: (i) consequential, indirect or special loss or damage; or (ii) any loss of goodwill or reputation; or (iii) any economic losses (including loss of revenues, profits, contracts, business or anticipated savings), in each case, even if we have been advised of the possibility of such loss or damage and howsoever incurred. Our maximum liability to you in contract, tort (including, without limitation, negligence) or otherwise arising in connection with this User Agreement or the racebikemart.com shall be limited to £50. Notwithstanding any other provision of this User Agreement, we will be liable to you without limit for any death or personal injury caused by our negligence and to the extent that liability arises under Part 1 or section 41 of the Consumer Protection Act 1987 and for liability arising from statements made fraudulently by us. 10. Complaints If you believe that your intellectual property or other rights are being infringed by racebikemart.com, or if you are dissatisfied with racebikemart.com or any aspect of our service, in the first instance please contact racebikemart@gmail.com.